I received KAIST calendar from Prof.Kim. It’s really cool. Honestly speaking, I don’t use paper calendar usually because I’m iCal user, it can sync with my iPad and iPhone, it’s really useful, but I think paper calendar doesn’t have that kind of usefulness. However, I was surprised at this quality, I felt I want to use it with only glance. This calendar looks like expensive, it’s because paper and photograph quality is high and detail is not cheap. This calendar is made for celebrating 40th Anniversary of KAIST. Osaka university has long history more than twice but can Osaka university make expensive things like this? There is one more surprising truth. 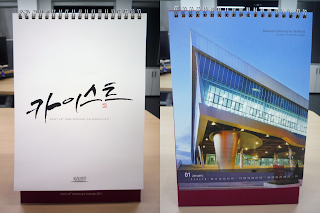 This calendar was made by KAIST facilities. For example, the design director of this calendar is Prof.Kim Hyunjeong, a beautiful lady. Osaka university has many professors more than about three times but can they make cool things like this? or when they have a professor who can design great things, can they have a skill to evaluate correctly those great design?